It may be simply part and parcel of being an architect, but it is striking how much Linda Thiel, partner and director of Swedish practice White Arkitekter’s first London studio, feels the importance of place and its effect on all who pass through it. She carries into her work the legacy of her childhood in Stockholm where, she recalls, ‘both parents work, children go to school, it’s very collective’, and this continues to be a huge influence on her work to this day. While Thiel previously ran her own practice, White Arkitekter seems a natural home for Thiel and an essentially Swedish one at that: established by Sidney White in 1951, the practice Thiel describes as having been ‘growing and working alongside Swedish society for 65, almost 70, years’. Its aim was always to improve society through architecture; today the practice’s ethos, and hers, embraces collective thinking and a commitment to sustainability. The decision to open a London studio came after increasing numbers of UK-based clients. Geoff Denton, the other partner of the London studio and a Brit who had lived in Sweden for 20 years, was happy to move back first to kick-start the project. Thiel soon followed. Despite having to uproot her family for the move, Thiel and her husband Lukas, also an architect, felt that their professional skills would allow them to work anywhere in the world. The move has been successful and the London practice is thriving; yet there was initially a culture clash on a professional level, as an early London meeting revealed essential differences in approach. ‘Everybody just walked out and left...we absolutely did not agree on anything,’ Thiel tells me. This turned out to be an extreme occasion, but it still came as a great shock. She explains: ‘[In Sweden] we learn from kindergarten that it’s all about team-play’, but as she now realises, ‘not everyone is brought up the same way’. This challenge has become a positive influence – in listening to and taking in all these opposing opinions, Thiel is able to combine the best factors for the collective good of a project. Throughout our talk Thiel references her heritage. At times she uses it to her advantage – ‘playing the Swedish card’ and using faux misunderstandings to prompt provocative conversations – but it seems clear it is simply too intrinsic to avoid. She has since learned to see this as a strength, but it was a lesson learned the hard way. 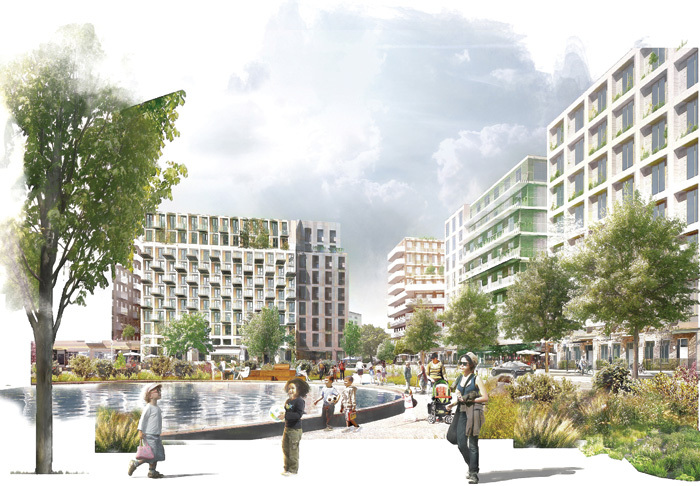 She frames the White Arkitekter win for Phase Two of the Gascoigne East project – the regeneration of an estate in Barking, East London – as a high after a real low. After a bid for a similar project was unsuccessful, Thiel and her team were left exhausted, but came to the realisation that they were trying to be ‘too British’. Diving immediately into the Gascoigne competition, itself a highly competitive, fully open process, they reassessed their approach, deciding: ‘OK, we can only be super-true to ourselves, so whatever we do, we need to love it.’ Their hunch was soon proved right: White Arkitekter’s UK clients value the practice for its distinctive point of view. This is aided by Thiel’s own enthusiasm for Swedish design, and she is happy to guide interested collaborators around Stockholm to see for themselves the latest developments. With this approach, Thiel is able to share what she is passionate about, whereas while they tried too hard to fit into the London context, White Arkitekter was compromising its own values. Her resolve is admirable, but Thiel is happy to acknowledge that she is never entirely out on a limb: the White name is what allows the team to pursue its choice of projects. The London office is able to act like a start-up, ‘working on competitions, making clients’ as it chooses, but with all the benefits of belonging to the one of Stockholm’s biggest architecture offices. It has extensive resources and expertise, and enjoys a legacy of success that means it hasn’t had to ‘fight for projects’. Nor is the team in any way inexperienced: Thiel previously ran her own practice – covering hotels, small homes and office projects, urban design and residential – and her and Denton’s team (currently a mix of Swedes, Europeans, Brits and an Australian) is recruited from White Arkitekter’s Swedish offices to ensure they understand the practice’s ethos. From an initial team of three, the London office now numbers 10, due to be 12 in two months, and 15 in six. Though based in London’s Shoreditch, its outlook is by no means capital-centric, and is currently pursuing projects in other UK cities including Leeds and Newcastle. I see this as reflective of Thiel’s attitude to place, and she is keen to steer our conversation this way. In the North, Thiel says, she finds the mindset a little more Scandinavian than that in London. She attributes this to the space to breathe that these northern cities allow, which for the practice and its clients means the freedom to pursue a sustainable agenda. Thiel believes in focusing on projects that could result in real change, but this is not to suggest a lack of ambition. Thiel is always thinking ahead and thinking big – after all, the Leeds Climate Innovation District masterplan was her response to an invite to design just a few of the houses. Now comprising 516 low-energy homes and integrated amenities, the CITU project is a well-thought-out, mixed-use neighbourhood in a central brownfield site – a perfect example of Thiel’s commitment to building society through architecture. She describes herself as ‘not the manager type’, and her approach to each project is to start on the ground, talking to people, gaining a firm grasp of what the place is now, and imagining what it will be in years to come. Larger projects have brought Thiel into close contact with experienced and established organisations, such as local housing authorities and companies such as Be First, both which will be integral to delivering the Gascoigne project: a project aiming to create high-quality public space for families, students and the elderly. Be First’s experience in affordable housing for London is invaluable, but likewise, in addition to her training and professional experience, Thiel acknowledges the importance of her own lived experience, of ‘being a working mother, sorting out childcare...understanding the best route to school, [or to] grocery stores’. An architect, of course, is not infallible, and Swedes, Thiel says, hold themselves and their society in high-esteem – as beacons of health and equality – but a recent study showed that teenage girls were significantly less active than boys because of the unsuitability of urban space for their needs. She describes this as a wake-up call. Despite a high industry-percentage of female architects and planners, urban design was still unable to meet the needs of these teenage girls. Architects have a wealth of tools at their disposal to communicate complex problems to the public, but in this case ‘we realised that they were all speaking different languages’. A new approach was needed. The resulting project, initially taking place in Sweden and later transferred to London, ‘Places for Girls’ innovatively involved a local theatre group. This, she states, was a great way ‘to make everyone understand and talk about the same thing’. The immersion in the play’s narrative, performed in the real locations of the estate, brought the planners and architects into the environment and experience of the girls’ lives. Aside from her project work, Thiel is active in public debate, participating in the London Festival of Architecture, FutureBuild and the Urbanisation Forum last year; as well as sitting on the OPDC (Old Oak and Park Royal Development Corporation) place review group. These platforms introduce her to the people and organisations working to improve architecture, design and urban space, and allow her to share her own experience to a wider audience too. Praising organisations such as NLA (New London Architecture) and the work of the Cabe Design Review, Thiel believes architects should ‘be advocates for culture and society’, and that ‘sometimes when we just get so into producing and delivering projects we forget about being out there and discussing important things.’ Thiel strikes me as extremely determined, remaining committed to fighting for the ‘important things’ with each project she tackles. Opening a studio in a new city has been the kind of challenge that Thiel thrives on, and we can be sure that neither she, nor White Arkitekter, will become complacent despite the success the London team has already enjoyed. ‘Obviously one can never copy-paste anything,’ Thiel says. She believes the practice’s London studio has plenty of room to grow, and feels fortunate and humbled to still be on the learning curve.